In some ways, 2008 seems like yesterday, but as I recall my history, it seems like a whole different lifetime. As I said in part I and II of this letter, headaches led to MRI’s which revealed a tumor. Although the tumor seemed unrelated to the location of the pain, its speed of growth required surgical removal. When it rains it pours, and so did other “unrelated” health issues of skin cancer, a noise in my ear and swallowing problems which led to coughing issues…but the brain surgery took priority. I was already scheduled to speak in Phoenix, AZ and Louisville, KY those two weekends. I know anyone would have understood if I had decided to cancel due to impending brain surgery, but what happened in those two weeks was a wonderful alignment of priorities. “What is important now?” dominated my thinking. If I were truly given only two weeks left to live, what would I do? The song says, “I’d go skydiving; Rocky Mountain climbing; ride a bull…” but none of that came to mind. Although I think the chances of handicapping my voice were greater than the chance of death (The surgeon had said he wouldn’t come close to the life-threatening vein. ), it brought the urgency of life to a head, as well as the momentousness of the ability to use my voice. I wanted to live my life on purpose, and I felt like my message to the stadiums those two weekends was my purpose, or I would never have scheduled to leave my children, even before the diagnosis. Each weekend, I changed my originally planned speech and told of the upcoming surgery and the heaven that awaited for those who have faith in Jesus Christ – whether the finish line would be October 15 or any time before or after. During this time, the news of a fatal car accident jarred me to remember that we are all dying. EVERY day is a day that may be the end of our “dash”, and priorities should be lived as such, impending surgery or not. The moment I dreaded had arrived: we needed to tell the kids. We knew we had one promise we could make: not “Mom will be ok,” nor, “It will be just like always,” but that God is in control. Pride of being a mother is a difficult thing to fight. Feeling the heavy weight of responsibility yet keeping perspective that if God chooses, it will be relinquished in a moment can only be accomplished by surrender. I surrendered (again) that I was not the one taking care of my children; God was. If He chose for me to reach my finish line during brain surgery, my children would still be in His care. True surrender is the most humble act. I would have told you I surrendered when I was led to Christ at the age of thirteen. Again, a deeper surrender occurred when I “lost control” (which of course was never mine to begin with!) during infertility challenges. I have often surrendered during my battles with pride. But I had never before completely surrendered to the thought that the world would just keep turning in my absence. After a funeral and time, hearts who may have missed me would heal, and life would continue as it was…without me. The church would find another musician; friends would get back to laughing; business would grow. I am the proverbial pea in the ocean. God’s ocean. Removing me was not a big deal. I suppose that is the humility with which we should live at all times, but nothing brought this to realization like a life-threatening storm. I know his comment frustrated my husband who wanted more concern, but the child’s words were a little note from Above: the kids would be fine. God is in control if I am healed completely. God is still in control if I have reached my finish line; it would be heaven. Heaven is the finish line no matter what happens to my today. The first surgery on the 14th went better than planned; the arterial scope revealed there was no need for embolization to stave bleeding…answered prayer! Because of that, I was able to stay in a regular room and have one less night of ICU. She and I prayed together on the phone from my hospital bed, as I felt her come to the knowledge of what it means to be a sinner who is completely forgiven and saved by Christ. Chris and my brother Tim visited with me before heading to their hotel, and I waited for the morning. I glowed with the joy that only comes from knowing a soul will be with me in eternity. It was ironic that this guy who was probably used to trying to calm people’s nerves was trying to figure out mine. “I need not worry about tomorrow, God is already there,” I quoted a favorite saying. I knew I was in my proverbial “basket floating down the river,” – two IV’s, arterial lines, tubes coming out of every angle and all. Like baby Moses, I was secured by God’s plan, waiting to wake up 2 to 14 hours later, to see either Chris, or Christ: completely surrendered to His will. Oh! How I pray I live that way out of the hospital bed! I guess the 15th was quite an exciting day full of drama, according to the surgery blog, which I was able to read weeks later. The tumor was surrounded by a sheath, which protected any nerves from being touched. No nerves to my mouth were damaged! The tumor had “fingers” that went into my right ear, so, unpredicted by the MRI’s view, several bones from my ear were “eaten through” and were removed. In one of my few memories of recovery, the brain surgeon motioned “YES!” with a clenched fist when I reacted positively to noise in that ear. Although hearing was lost for several weeks due to swelling, the nerves were not severed, and hearing was restored by 4 months post-op. I found out a couple years after the surgery (probably because my memory of the events was tainted) that there had been a 24-hour prayer chain during October 14-15, 2008. Apparently, all through the night, every 15 minutes, people were assigned to pray – on the phone with one another- in Michigan, Florida, Phoenix, Salt Lake, Louisville, etc. Wow. I learned what it means to be part of the body of Christ. The headaches, the swallowing problem and the ear noise were all healed. By January 2009, Chris was forgetting I was recovering and asked me to go snowmobiling! (I said, “no,” and reminded him the helmet would not feel good.) Really, less than three months after surgery, I felt better than I had felt in years. Chris said, “I feel like I got my wife back!” I still stand in awe. I never before 2008 thanked God for a reflex like swallowing, but it still comes to mind. I learned that I have taken the body’s involuntary reflexes for granted. I feel extra-blessed if I get a glimpse of God’s plan, when something I perceived as bad turns through a winding trail to be better for me after all. My brother’s melanoma was such bad news, but if he had not called me, I may not have had the skin exams – which led to my recognizing the skin-healing problem. I cannot imagine I would have survived brain surgery lacking the ability to heal. I believe my friend (who prayed on the phone with me from the hospital bed) was changed for eternity. Heaven instead of hell… when my illness caused her to humbly reach for a Savior (John 3:16). There is no greater joy for those who ask. Despite whether we see the good coming from bad, we can be thankful for the struggles, because they promise to give us perseverance, character and hope (Rom 5:3-5) and increase our pain tolerance, too! Although He may not remove you from the water, may you experience His peace as He calms the storm within. 1. Will the tumor come back? – I was told there is a documented average 20% chance of return when they get clear boundaries around the tumor’s location. Since they did not get clear boundaries, the chances would normally be considered greater, but my surgeon was very confident that he got every cell, so any return would be due to its ripe environment for growth. At the five-year mark, the chances of its return decrease significantly. 3. Do you still have headaches? – Yes. I am back to “normal”. In October this year, I was even speaking in front of a crowd – lights and all- with a migraine. To me, it was a testimony of increased pain tolerance. The occasional headache now comes as a blessing, reminding me of my past as “the leper” who comes back to say thank you. 4. Was the brain tumor caused by cell phone use? – I have read probably too much information on this topic. Although evidence is still questionable, it can’t hurt to hold cell phones far from the ear, and limit children from holding phones to their heads. (Their skulls are softer and the radiation has been measured much further into their brains.) My guess is that a cancer survivor who thought it had nothing to do with smoking could probably have written a letter like this in 1950, but of course my guess could be wrong. 5. Do you think your healing was a miracle? – I don’t feel worthy of the term, “miracle,” considering the miracle of a virgin’s birth or raising of a Man from the dead. However, I don’t take from God that He provided answers that the doctors were unable to predict. To God be all glory. This entry was posted in Health of It, Motherhood, Rooted in Faith, Sister to Sister, Uncategorized and tagged brain tumor, cancer, Chris Brady, heaven, hope, Orrin Woodward, prayer by Terri. Bookmark the permalink. Thank you so much for sharing such a trying time Terry. I do understand how difficult that is. I know that I, for one, am so grateful you are still here to inspire. Thank you for courageously and graciously filling in all the blanks! We prayed for you and followed your brother’s blog faithfully during that time. How joyful we were to read the good results! I am so glad to know “the rest of the story,” or as much as you are willing to tell now. I can relate to your condition, my husband started 2 years ago with stomach cancer having the tumor removed and chemo treatment. Then last May the cancer spread to the brain with yet another tumor. He had that tumor removed and chemo and radiation treatments and cancer free for 9 months. Now with a follow up and very bad headaces he has 2 new tumors. We will find out in the morning what kind of treatments can be done for him, with family and friends he is never alone with this journey. Oh turned 60 last November. Charlotte, I am sorry to hear of the current suffering. You and he will be in my prayers! Wow. How humbling for us to receive such a gift as you are sharing. Please don’t ever stop doing what you (and Chris and the other PC couples) are doing. We all need models to follow and pattern after, using our own gifts and abilities, to glorify God. Thank you for sharing. Thank you for sharing your life Terri. As you say, all glory to God! I agree with Kristi and the others, thank you for sharing. I remember my leaders sharing your news with us and asking us to pray for you. I remember signing a card and praying for you. I am so glad that you have been a part of my life. Thank you for your example, your love and your help. Thank you for sharing your story Terry. I can’t even begin to imagine what those months must have been like for you and your family, but we are all so thankful that you were healed … healed to save so many more lives through your teachings. Praise God! I find myself struggling to hold back the tears as I read of your amazing faith and God’s amazing grace. Thank you for, as always, being completely transparent. I remember your speaking engagements shortly before the surgery and I cannot believe your strength. Strength that could have only come from the The Comforter. Thank you again for sharing your heart. Thank you Terri for sharing your story…it brings back a steady flow of memories from my Mom’s battle with breast cancer and my daughter’s battle with a brain tumor. Like yours, some were very difficult days, and continue to be, laced with peace and assurance of the presence of Jesus. Through a current study of the book of Daniel my greatest fears are being exposed…being diagnosed with breast cancer and/or my daughters tumor growing. I can’t tell you how timely your story is to me, reminding me where my hope comes from and how He is so worthy to be TRUSTED. Thank you doesn’t seem like enough to say, this must have been very difficult to expose these details of your journey but I can encourage you that your light for Christ is shining and is being used in a mighty way! Daniel 3:17-18, Isaiah 43:1-4, James 1:12, 1 Peter 1:6-7. Terri, what a tremendous testimony of God’s sovereign grace! Thank you for sharing with us 🙂 You are a blessing to many! Oh Terri , I am so blessed by you ! I was reminded of the first team major I attended which was the very one you shared the upcoming surgery . I will never forget that moment as I was amazed how much peace you had and confidence in our Lord to bring you thru. It was something I held onto as I approached the impeding diagnosis that next month . My heart was kindled of the strength you had . It gave me hope to know God is in control . Moving & Inspiring. God is Great. Thank you so much for opening up your journey with us. I remember my first major was in Phoenix when you shared what you were going through. You have inspired me to play hurt, and to rest in His plan for our lives. Your blog has been my favorite to read. Thank you again for sharing. Thanks for sharing!! Your attitude in the struggle is an inspiration! Dear, dear Terri…………..from the first time I met you, I knew that there was something “different” about you — the ease in which you spoke, the glimmer in your eyes, the comfortable feeling you give everyone around you, as if we’re the only one in the room, and the LOVE…..you seep love, & now we all know the source! Christ shines through you, Terri, especially through all the broken places that you’ve been sharing! You give us all courage & the hunger to know our Lord in a more personal way! May He continue to shine through all our moments, while we remain in the “dash”! This story is just amazing to me! Praise be to God as He knew we ALL need you here!! 😊You pour out your love for Christ EVERYTIME you speak! You are such a blessing to so many!! What courage and strength you have!! SO PROUD to be following your example!! THANK YOU TERRI!! Terri, you are such an inspiration. I love your total surrender to God’s will. I’m so thankful that God kept you here with us. You are the example we all need. Thank you for your transparency! The many ways this story has blessed me is too much to list here. I pray that one day we will meet and talk over a smoothie! God Bless You Terri! I am a close friend of Brandon Perry’s. he forwarde me a link to your blog (as he’s do e several times). I sure can see Gods hand in your writing. And I appreciate you being so open. Thank you for sharing this struggle, and for praising God through it all. I have learned first hand the importance of letting God have His way through trials. I hope God gives you many more years with you family! Whew Terri that was an emotional one. You even had my heart racing as you discussed your thought process going into the surgery… Waking up not knowing if you would see Chris or Christ. Im speechless, I have never known anyone to have your strength. Thank you, thank you, thank you! Terri, you are an amazing leader and a shining example of what it means to be a Christian woman! Thank you for sharing your story and reminding us all to live each day to the glory of God. Thank you Terri so much for sharing. I love your faith so perfectly expressed. I feel very blessed to know you and to be in a place where I can learn from you. Thank you so much for being so transparent..
I’ve been getting better emotionally since. Then me & my husband were talking about having another baby since nothing has changed in a while. I was still afraid but hearing other people’s stories give me strength & after hearing yours, I think we’re going to bring one more caring, hard-working human being into the world. That’s what God put me here to do afterall. I never thought about God having a plan for my son after I’m gone ’til you said it. I always imagined plans for my son dying along with me for some reason. Again, I’m Abigayle & I’m also a caring, hardworking Christian, 23 years old, a mother, a wife, a homeowner, & lastly a brain surgery surviver. I knew how this one turned out, but still couldn’t get through the words fast enough as my mind kept jumping ahead of where I was reading. Thank you for sharing this. Wow Terri , I must admit you had me on the edge of my seat for three days ! I remember when you announced , in Loiusville , that you had a tumor and were having surgery in 2 weeks . We were devastated by the news , but had so much respect for you for serving us that weekend . We certainly would have understood if you weren’t there . Your strength and total faith in the Lord was a great lesson for me and so many others . Thank you so much for sharing such a personal experience . Thanks for sharing this story. It is very thought provoking. It reminds me that with Christ, nothing is ever as bad as it seems. Ultimately, in Him, there is always a happy ending. It’s interesting the ways God chooses to bring us to awareness. When I was in college, my dad was putting up a storm window outside and lost his balance on the ladder and fell off, crashing through the pane of glass as he fell. It left a large gash in his leg and I had to rush him to the hospital. After sewing him up, the doctor was looking over his medical chart and noticed he had never had a preventative colonoscopy before (rather unusual I guess for males in their late 50s). So he went in within a couple months just for preventative measure and they found that he had prostate cancer. Luckily, it was still small enough that they could operate. A few months later, he had the surgery, with about a 2-week recovery time and they were able to get all of it out. Today, he is still cancer free. The funny thing is, if he hadn’t fallen through that pane of glass, he might have found out much later about the cancer when it might not have been so simple to cure, if even at all. God is certainly in control and we do not always know his ways or his reasons, but we can always trust that he has our best interests in mind. And to me, that brings peace which transcends understanding. Crazy how fast we forget to give thanks! (my daughter had heart surgery at age 5 months old – she is now 3 and 1/2 years old. Glad there is a scar on her chest so I am reminded of God’s hand on things and to give him all the glory and thanks!) Also, people ask me how I was able to be strong during all of that — and I get to point to God! You remind me that we can’t stop caring for everyone. Everyone, I suppose, is fighting their own battles and I’m sure that God is feeling our pains—as any good Father would. What a heavy burden! I’m so grateful for your recovery and that your mission on earth is not finished, so we can be blessed on this journey together. Jim had cancer 10 years ago and it now seems like a blur. Yes, God is always reminding us to be thankful. I just hope I don’t have to be reminded too much:). Love you. Thanks for sharing your experiences. Only God knows why we survive after something so traumatic and what his plan is for us. 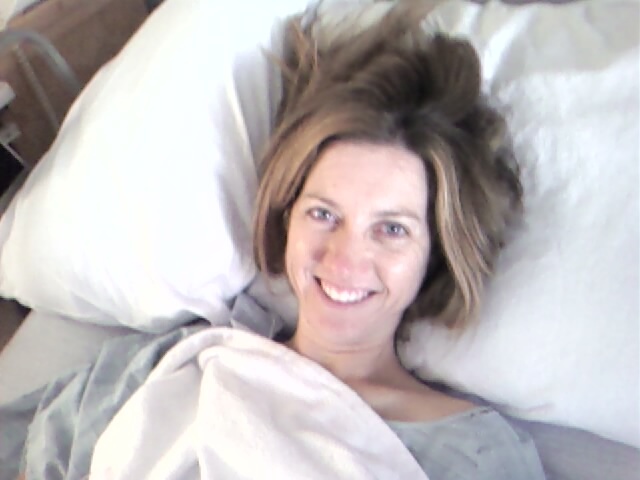 I had emergency brain surgery July 4, 2005. Not what I planned for the holiday, though I don’t remember anything about the day or the following 2 weeks while I was coming back to reality. When I did wake up, my world had changed drastically. With amazing doctors, therapists and tremendous family and friend’s help. I worked to regain most of my lost skills. After two and a half years I was able to go back to work. I discovered LIFE last year through a co-worker, Linda Williams, and am loving it. The positive attitude in a business was something I had been looking for for years. There is something in God’s plan that we haven’t accomplished yet or we wouldn’t still be here. Terri, thanks so much for sharing that chapter of your life with all of us. God is good all the time and all the time God is good. Selfishly I’m happy that his will gave us more time with you and gave you more time to act out your roles as a child of Him, a wife, mother, sister, daughter, and dear dear friend! Love you! Thank-you for sharing with us your journey , May the Lord our savior keep pouring out his blessings on you and thou you. The Lord is so good Praise Jesus amen. Our daughter boyfriend, Jesse is only 17, with a rare form of stomach cancer. He was given 3mths to live. The body of Christ came and prayed over him. That was 2 yrs ago. He is the youngest, and also longest living to be documented . He just had surgery to remove 2 Lymph Nodes .from him that was full of cancer. His stomach liner was clear praise Jesus. He is now in recovery for the next 6 to 8 weeks. Jesse family of 6, being raised by a single mother. Our daughter also has heath issues, and is seeing a surgeon to have a lymph node removed. She is 20 yrs, her life from the start has been a miracle . I praise Jesus everyday for her. I only share this because of your strength and wiliness to be open. You have blessed me, at so many levels … remind me who is in control 🙂 I have shared your story of encouragement, and testimony of your faith . I praise Jesus for you (sister in Christ) and the leadership . It is is the most precious and exciting thing to hear and know that another soul has been saved and will know Chist! I am thankful for all the wonderful things God has done by using your circumstances for His kingdom. If nothing else good was to come out of it, One soul saved is worth it all!!!!!!! wow. This is a good example of being a women who trusts in the Lord. I admire your strength and peace. Beautifully written and inspirational. Thanks for sharing. I am so glad you shared this time in your life. It is such an encouragement to so many who are struggling right now to be encouraged by your testimony. God is good all the time! Thank you, Terri, for being willing to share these deep and personal life experiences. God has truly given you a gift in writing but also He is using you to impact this world for His Kingdom! I pray that you continue to seek Him first in your life and live on purpose! You are an amazing lady! Praise God for survivors! Mine was benign, so I am only a tumor survivor- but so much to be thankful for! Thank-you for being so open with your most personal life experiences, in hopes it will help those who are struggling. Terri, thank you so much for sharing your amazing story and Godly insight. Your great blessings are a true blessing to every life you touch, either in person or from your blog. I thank God for you and your family. I read and reread these posts. It’s all about grace, faith, purpose, and peace. Through your story, I am learning to surrender and give total control to the Higher Power. I better understand why we need to be free from day to day carrying bucket jobs, to build a wealth pipeline engine, and to have a community of friends, fans and family that we can count on. I was at Louisville when you announced that you would have surgery, I better understand today what you went through and how purposeful you are to continue your journey on the stages although you were facing YOUR life threatening issues. Your blog is one my favorite. I like your writing style melting into words deep content and soft humor. I can’t wait to have ¨Letters to Lindsey¨ as a book in my hand. I still remember the phone call from you, Terri, and the feeling of being punched in the gut and the tears and prayers for you after we got off the phone. You have been an incredible blessing in my life, one I could never repay, and your testimony about the power of God and your peace during that time has taught me more about God and how to give everything up to Him than any other person. I love you dearly and I’m so thankful God had more work for you here to accomplish. You’re an amazing person and I’m so thankful to know you and call you friend!